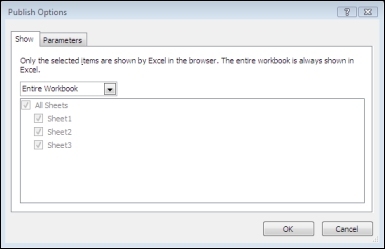 For more information about Excel Web Access web parts, see the article Display a workbook in an Excel Web Access web part. 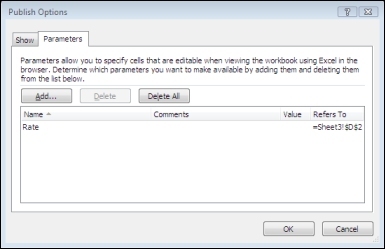 For more information, see the article Differences between using a workbook in Excel and Excel Services . For example, in the following graphic that shows a worksheet in the browser, cell D2 has the defined name Rate. In the browser, a user has entered a value, 5.625, in the box in the Parameters pane and then clicked Apply. That value then appears in cell D2, and the formula in A2 uses the value in D2. The result of the formula is recalculated, and shown in A2: $1,151.31. See Excel Help for information about how to define ranges. 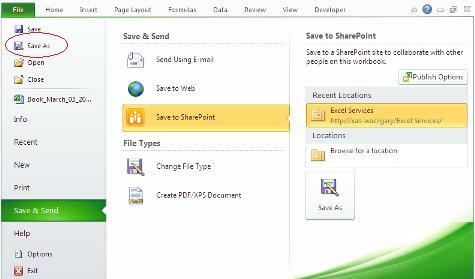 Note   If the Save to SharePoint command is unavailable, you can still save the workbook to a SharePoint site by using the Save As command. The Publish Options dialog box will not be available. You can also directly upload the workbook from a SharePoint library. Users can view and edit the contents of the workbook in the browser by going directly to the site where the workbook is saved. Note   By default, all sheets are selected. To quickly make all sheets viewable again after you clear some of the check boxes, you can select the All Sheets check box. Note  If you select items that have the same name (such as a chart and its underlying table of data), only one of these items will be available in the browser. To show all the items, you must make sure that each item in the workbook has a unique name. You can rename tables on the Design tab in the Properties group, rename PivotTables on the Options tab in the PivotTable group, and rename charts or PivotCharts on the Layout tab in the Properties group. Duplicate items, such as named ranges, can be renamed on the Formulas tab in the Defined Names group. Choose a location in which to publish your workbook. There may already be saved server locations under Current Location, Recent Locations, or Locations from which you can choose. If there are no such locations, or you want to save to a new location, under Locations, double-click Browse for a location. In the Save As dialog box, enter the web address for the SharePoint site, and then browse to the site or library in which you want to save your workbook. If you haven't already selected individual worksheets or items or set parameters, click the Publish Options button.